*An opening ceremony is held at 10:00 am on November 1. The First Exhibition Room is closed from 9:45 to 10:20 am. 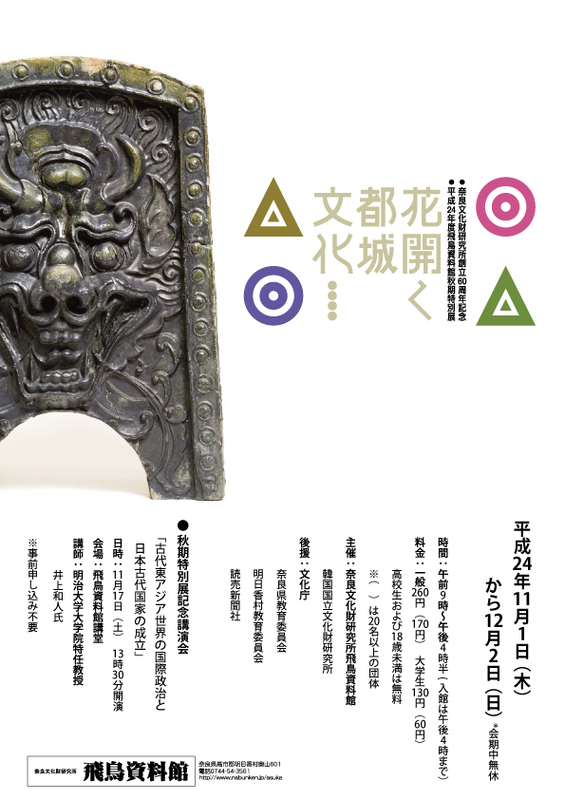 Nara National Institute for Cultural Properties cerebrated 60 years anniversary of its foundation in 2012. In its history we endeavored to promote cultural exchanges with oversea researchers and institutes. Above all, the joint study of ancient capital system with Korea has been a very important and productive project. In this exhibition we would like to introduce the latest result of this collaborate research with National Research Institute of Cultural Heritage of Korea. At first the exhibition was planed as a joint undertaking of Japan China and Korea. But it became difficult to introduce Chinese relics for now. So it is joint-hosted by two countries of Japan and Korea.